For reasons still unknown, I chose to be inventive and selected a (disastrous) variation of options 2 and 4. Instead of doing the work myself, I contacted a local guitar repair shop. The proprietor had worked for a well-respected local luthier and repairman, someone who had worked on my guitars years earlier, and who had indicated to me he was trying to get away from the business for health reasons. 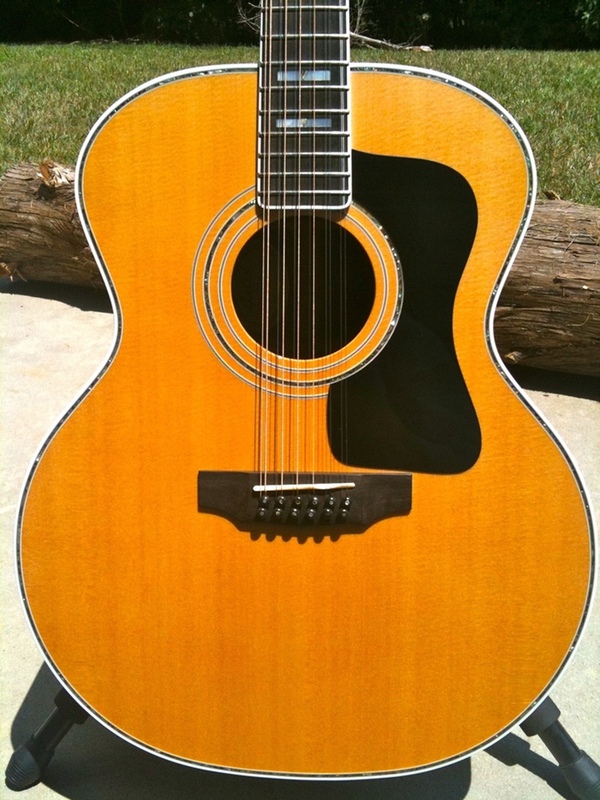 I conveyed my desire(s) regarding my 12 string to this former colleague of his who was quite familiar with Guild guitars and authorized an effort to correct finish issues as well as set up the guitar. It is astonishing how quickly time can pass, especially when an instrument repair is involved. 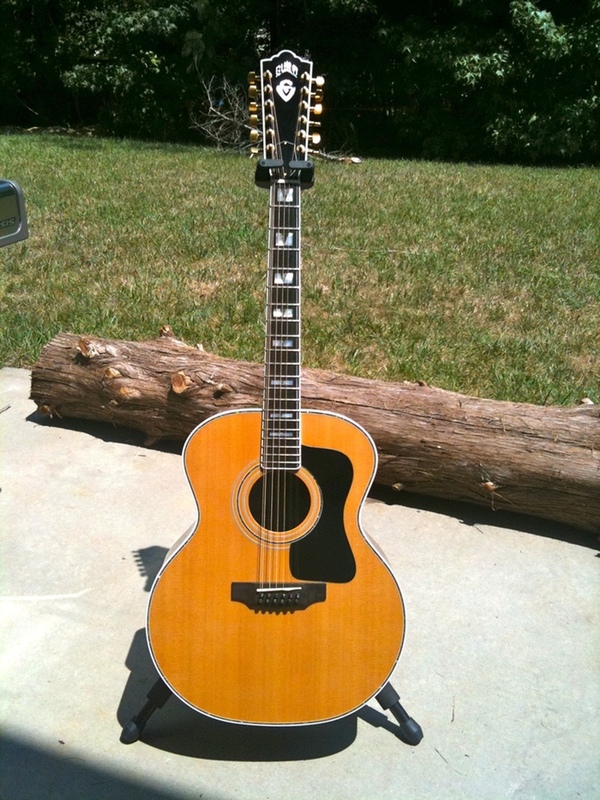 Several phone calls over several months eventually led to the delivery of my guitar. The fingerboard had been reduced to nearly half it’s original thickness. The entire guitar was now (spray tinted) a horrific mustard yellow, and the soundboard had visual thick / thin, high / low peaks and valleys where it had been hand sanded using fingertips instead of a sanding block. In three words: It Was Ruined! 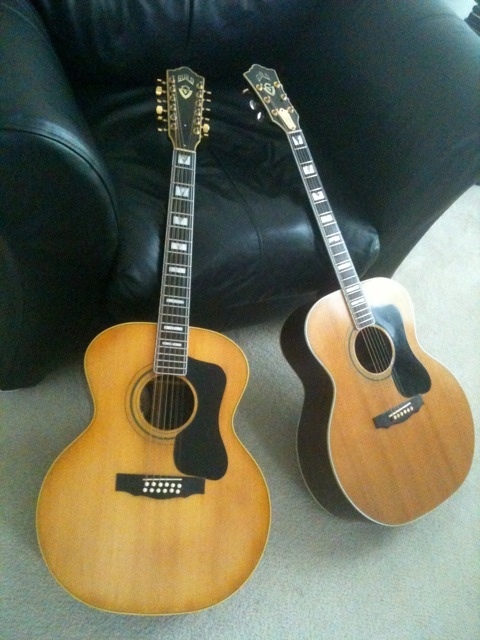 I shipped them my 12 string for evaluation and impatiently awaited their findings. I didn’t have long to wait. The call came, and I am convinced I could hear screams in the background. I was certain those sounds were in response to my guitar, though I was unable to discern if the sounds were the result of abject horror at the sight or from the pain of extended, gasping-for-air, rolling-on-the-floor laughter over the sheer stupidity of the decision I had made. Regardless, these guys were great, and confirmed the soundboard had been destroyed from hand sanding (it was paper-thin in places). They thought the mustard yellow tinting was ‘creative’ and also wondered if there may have been consciousness-altering chemicals present during the artistic portion of the endeavor. It was the only reasonable explanation. We talked at length and I determined to have them do as much as was necessary to correct the damage. We would replace the soundboard, matching the original bracing pattern and, since the neck had to be removed anyway, it would get reset to the proper angle when reattached. 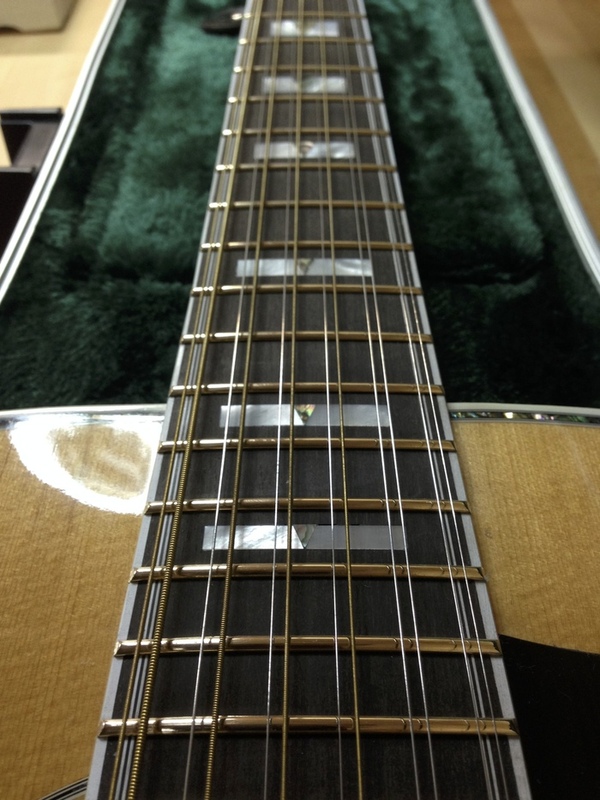 A new fingerboard was required, and a new bridge would be necessary. I figured we might as well refresh all the plastic bindings on the body and neck while we had the chance. 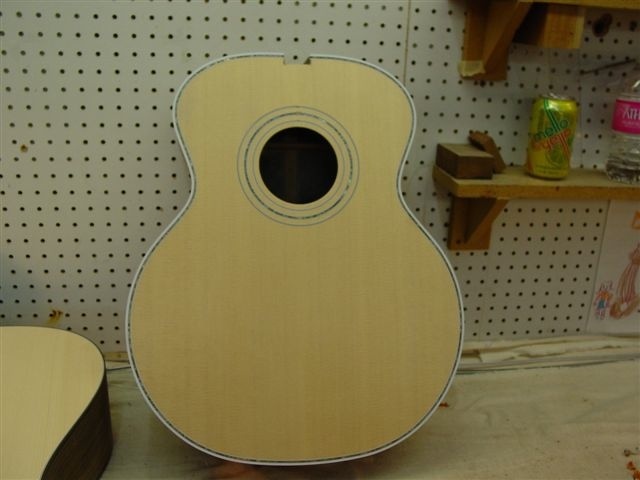 My custom requests involved upgrading the wood selection for the soundboard and adding Paua, one ring around the soundhole, and another around the top edge of the body. The entire guitar would get a new nitrocellulose lacquer finish. The estimate for the work was quite reasonable and I authorized the repair. Just a few short months later I heard a terrifying rumor: the Guild Custom Shop was to be closed - forever! I contacted the guys there and confirmed the story to be true. It was a sad time: some folks were pickup up their entire lives and relocating to the new Guild factory in New Hartford, CT while others were retiring or pursuing other opportunities. But my guitar was fine. The short version: my 12 string was literally the last instrument every to be shipped out the door before the shop closed for good! 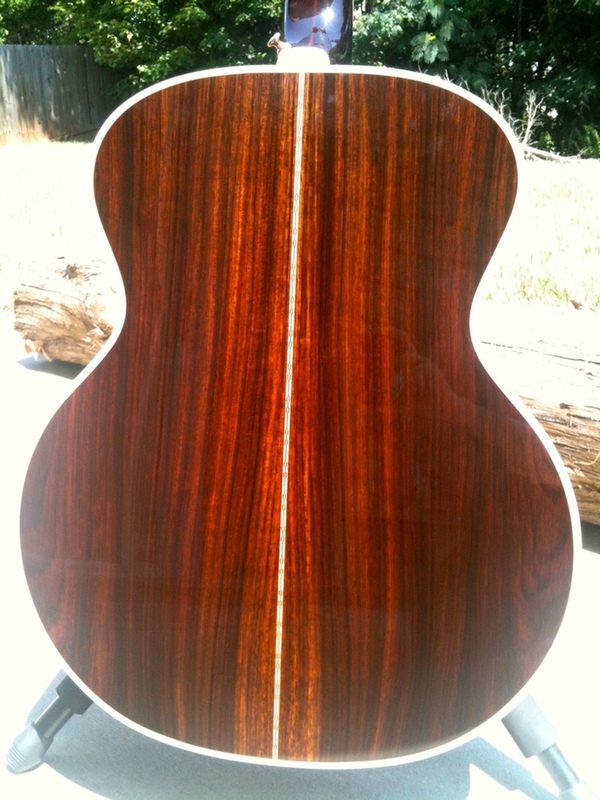 They did such a superb job rebuilding this guitar. Just the right amount of Paua, too! It was good wood to begin with but, with some extra attention and a new finish, the Rosewood really pops! 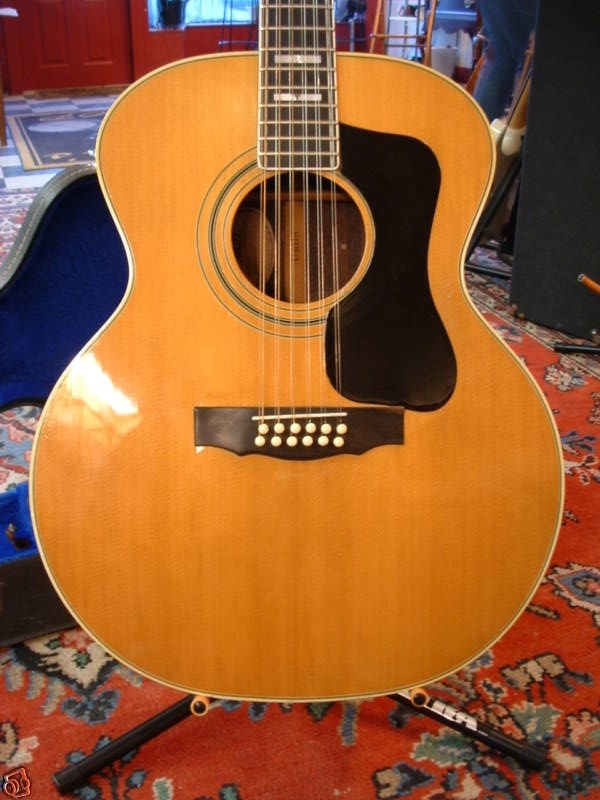 Once the F-512 was back in my hands, I fitted it with an L.R Baggs Anthem pickup and played the guitar for about a year before growing dissatisfied with the fingerboard, both mechanically and aesthetically. The new fingerboard had a tight 12″ radius and was fitted with nickel fretwire (just as it was supposed to). 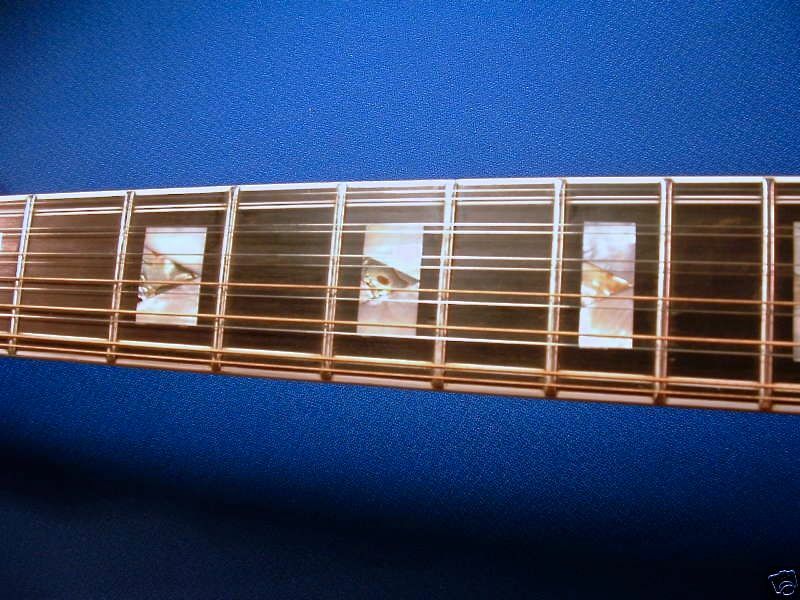 I determined to refret the guitar, altering the radius to a combination of the rounder 12″ at the first fret and graduating to a flatter 20″ as I moved toward the bridge, an approach referred to as a compound radius. 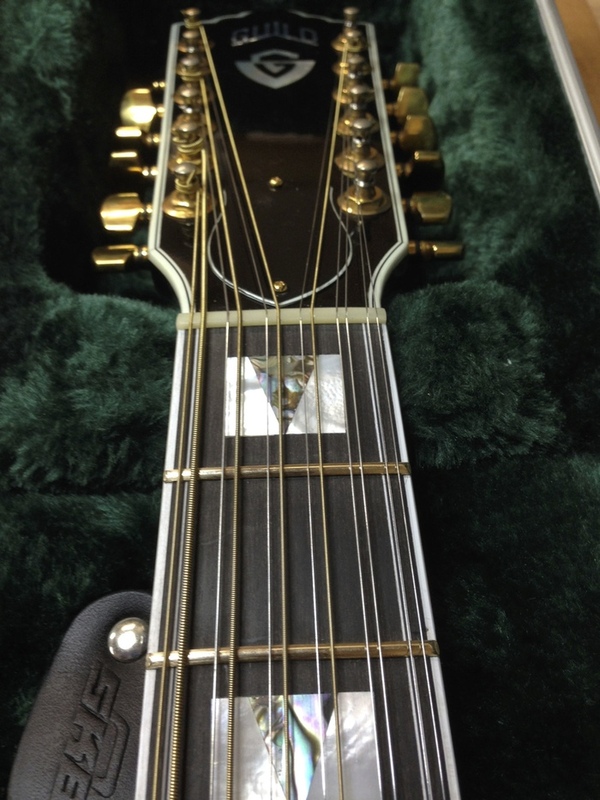 I refretted the guitar with EVO Gold fretwire (a super-hard material and tough on my tools, but really pretty stuff!). I made a new bone nut and saddle and adjusted the action as low as I could get it for my style of playing. Ahh, just right!